When you think of a significant cause and how best to show your support, there is no greater endorsement than pinning an emblem on your lapel, pocket or hat. It says you believe so strongly that you are prepared to publicly stand behind it, and that’s very powerful. On Anzac Day, we all stand in reverence when a Digger walks past, his or her badges of honour humbling us with every step. 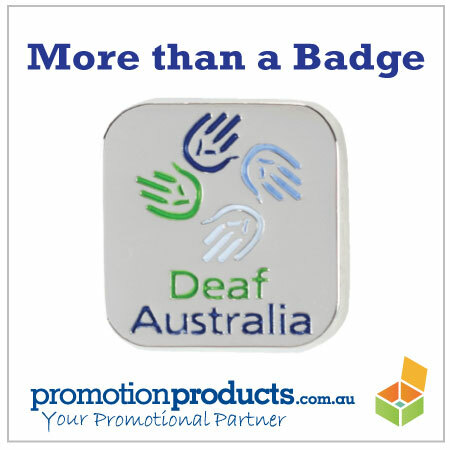 Take the Deaf Australia pin (pictured here). It’s a hard enamel coated custom lapel pin with weight and quality matching the intrinsic values of the organisation. It represents a body of people dedicated to assisting the lives of those who have difficulty with or are completely bereft of hearing. Many who wear the pin are either Deaf or hard of hearing, or are related to them or are friends. They share a passion and support, signified by wearing their pins. How worthy is your organisation or club? Would wearing a symbolic gesture like a lapel pin unify it’s members? It’s worth pondering on their commitment for a while. This entry was posted in business gifts, Giveaways, Promotional Items and tagged badges, pins by admin. Bookmark the permalink.